Meet Jarre AeroBull HD1: a £3900 French Bulldog wireless speaker | What Hi-Fi? Could this special edition breed of Bluetooth speaker be a dog lover’s pawfect present? 2018 may be the year of a FIFA World Cup and the Winter Olympics, but it’s also the Chinese Year of the Dog. 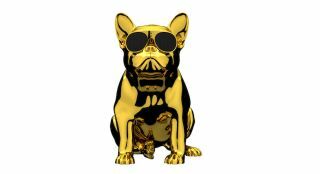 And to celebrate, Jarre Technologies has made a Limited Edition Chrome Gold version of its famed AeroBull HD1 speaker, designed in the shape of a French Bulldog. Like the £1350 original (which we’ve been tempted to pet at many showcases over the years), this new version also features built-in aptX Bluetooth and a 3.5mm input – and most importantly sports the same sunglasses that make the AeroBull the coolest mutt since Lassie. Through each “lens” is a 2in full-range driver, and somewhere inside lies the speaker's, ahem, subwoofer. The company – founded by French composer Jean-Michel Jarre – has made 99 of the chrome gold AeroBull HD1, each numbered and presented with its own certificate. The AeroBull HD1 also comes in a smaller, battery- and mains-powered version: the AeroBull XS1 - which has also been given a chrome gold makeover. The XS1 comes in a pair, of which 199 are available. Available exclusively at Harrods and Selfridges throughout the year, they cost £3,888 and £2,000 respectively – a massive bite out any anyone’s wallet. Naturally, to be a true man’s best friend, they’d have to sound good. And, with their four-figure price tags, you'd have to consider them serious underdogs.